Creating independent coordinating reports about labyrinth training sessions and contests. These documents must include as many details as possible about the athletes and the location. 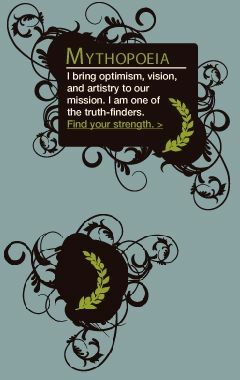 I bring optimism, vision, and artistry to our mission. I am one of the truth-finders. Dikaiosune and Mythopoeia, we need your strength to prepare for the Multiverse Olympiad. We have to create a plan for synchronizing labyrinths -- and we have to practice them before the Olympiad. In order to synchronize with all six types of worlds, we'll have to synchronize six labyrinths on this world-- most likely, one on each continent. Once we make the omph knot, we should be able to get more information from the other worlds about times and dates of the Multiverse Olympiad. But between now and then, we need to figure out how to organize our own Olympic-level labyrinth events, how to geographically coordinate them with each other and the other worlds, and how to train our runners to be competitive in a race against the other worlds. It seems like there are three key challenges, which dikaiosune and mythopoeia can hep solve now. We'll have to find space for and learn how to lay out Olympic-level labyrinths (as opposed to the smaller training labyrinths). How can we coordinate the races to start at exactly the same second in each of our six labyrinths? Start a Log of Record Training Times for the Lost SportNow that people are training all over the world to become champion lost sport athletes, we need to start a log of which teams are recording the fastest times on the different labyrinths. We can record fastest times and the names of runners in each city that is training. It's also probably important to log names of team members for the wall who are committed to continued training. Because one thing we now know for sure is that have a smart, fast, and well-synchronized wall is at least as important as having a fast runner! Eventually, when we do our synchronizing labyrinths, I think it will be important to be able to match up runners of similar talent on all of the different continents. One thing I was thinking about as I watched videos of runners from the different cities... I don't know if in other worlds, they compete men and women separately. We know for sure that the ancient Greeks only allowed men to compete in their Olympiad, but obviously the modern games have both men champions and women champions. Clearly, our teams can and should include both men and women in the same wall, but we should probably keep track of fastest men and fastest women's times. What do you think? Sophrosune, as the referees for the Lost Sport, you should be able to help a lot with this mission. And mythopoeia, as the official documenters for training events and synchronizing labyrinths, your strength will be important to include as well. Well, let's start a log forums -- or if you design a log somewhere else, please post a link on the discussion thread! You must sign the personal labyrinth register. You must show to the many worlds your intentions to finish the rite beforehand, by signing the labyrinth register. In the register, you must write your name, your location, your chosen place for the labyrinth, and the date that you intend to finish the rite. You must write this information at least one a day beforehand. The labyrinth register must be kept in the omphaloi. Typically, each main city has its own register. I honestly have no idea how or where we are supposed to do this. Is the register physical? Or can it be digital? What omphaloi are we supposed to keep it in? Help! Please build us a personal labyrinth register! Mythopoeia, we need your art skills to help teach others the Lost Sport! Can you make a "cheat sheet" that explains the rules of the sport? Something we can hand out at training events? Maybe you could borrow pictures from the Codex, but writing in -- you know, English? Or Spanish? Or Portuguese? and so on? What does the Codex mean? Mythopoeia, your strength can help us understand the big story. We need to figure out: What does The Lost Ring Codex really mean? We're translating the Esperanto here and here and here and here. So we know what they SAY. But what do they MEAN? Can you help us interpret the big story they're telling? Mythopoeia, your artistic strengths can help us leave traces of our secret mission all over the world. The best place to hide your secret is in plain sight. o I say let's start hiding our secrets everywhere we can! If you hide one of our secrets in plain sight, share a photograph! This page was last modified 01:38, 28 April 2012. This page has been accessed 13,547 times.